Welcoming a tiny human to the world is quite exciting, but designing a room for your first child can be a daunting task. Amongst all the other things you are preparing for, creating a room for them should not be the most stressful. Before you invest a lot of money into this new room, take a couple minutes to arm yourself with these helpful tips. 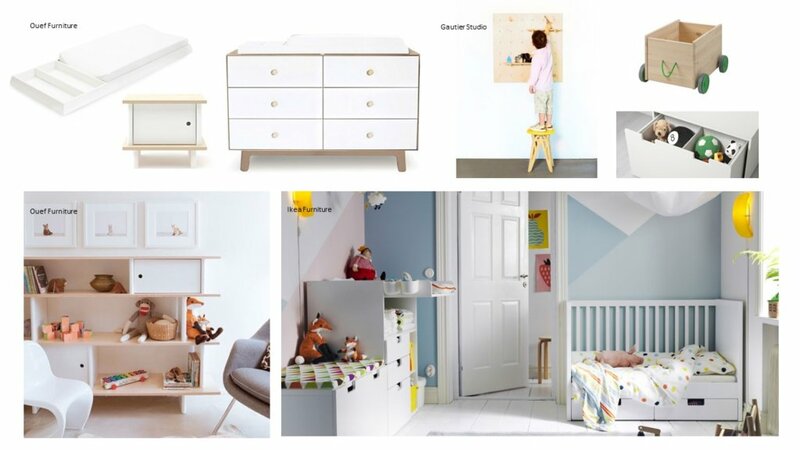 We hope that this will help you design a room that grows with your baby – saving you time and money in the long run! Although it seems like a lot of fun, going to the Disney store and picking up every possible Princess item is probably not the best idea. Yes, a themed room can be a lot of fun, but will it grow well with your child? Probably not, especially if you have a second one. We suggest choosing a style and not a theme. A good place to start is to decide on furniture finishes. Whether you go all white or a wood tone, keep it consistent. Also, try and stick to one feature color – a gender-neutral one is always a good choice. You can use this color on one wall as a focal point or have it in the textiles you choose. When choosing an interior paint, make sure to look for one with low or no VOCs such as the Natura paint from Benjamin Moore to ensure that your newborn isn’t breathing in any harsh chemicals. To add a bit of whimsy and fun to the space, choose a geometric pattern! Simple patterns such as stripes or dots and many other Scandinavian inspired prints are a good way to go. One of our favorite neutral lines is Ollie + Lime available at Westcoast Kids. 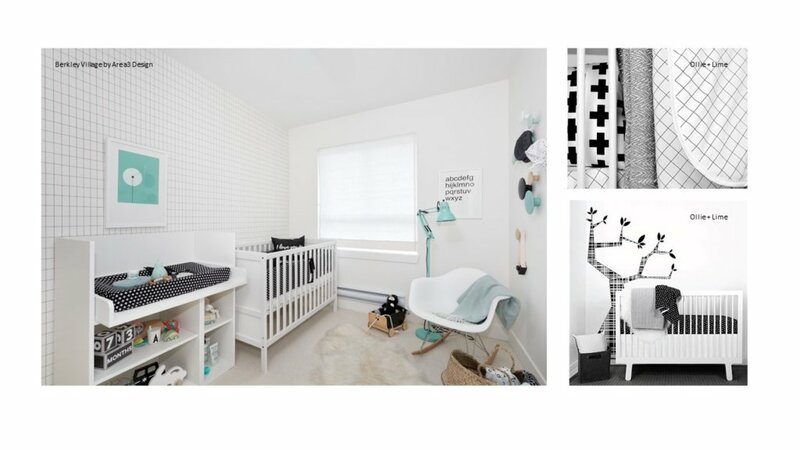 At our recent project Berkley Village we used this black and white bedding line along with a grid wallpaper from Ferm Living and Ikea furniture for a modern gender neutral nursery. Other fun ideas include an alphabet, animal, transit or nature concept. If you keep it simple with a decorative wall lamp, framed posters, or toss cushion it will be easy to change as your child grows. Have you ever noticed that the tiniest people need the most stuff? From toys to diapers, clothes to other gear, the stuff babies need is endless. The challenge is to find ways to store it because chances are, you don’t have a lot of extra room to spare. Getting creative may be the way to go! Wall shelves can be a great solution as they are out of the reach of children, but are accessible to you. Install them near your changing station and add some bins and baskets for convenient storage of changing essentials. Hangers in a closet probably isn’t useful at this time, so add some hanging closet storage instead that make storing tiny clothes much easier. These SKUBB organizers or TROFAST line from IKEA are very inexpensive options. If you have the room, consider finding a chest or shelving unit that you can add a cushion top too. Not only is this good storage for toys, but also doubles as a seat. Ouef is a modern eco-friendly children’s furniture line. We think their XL station is a clever multi-purpose solution. It can be secured to their Merlin 6-drawer dresser and doubles as a shelving unit, once the diaper years are done. Hang on the wall as a shelf or use as a large tray for storing baby toiletries. The mini library shelving unit can be configured and used to whatever child or baby needs (this could also look great in a family room). How about a pegboard for the nursery to hang or bin all those small items? We like the Cambria – Peg Board by Gautier Studio. Before you go out and stuff the room full of furniture, think about what you will need long-term. While the room is a nursery you will need a crib, a nursery chair and a place to change diapers, but these pieces will not permanently reside in the room once your child grows up. Think about the space that you have. By putting in a changing table, will you have space for a toddler bed in a few years? Why not consider a change table that doubles as a dresser with a removable top? When buying a crib you might want to consider one that converts into a toddler bed. 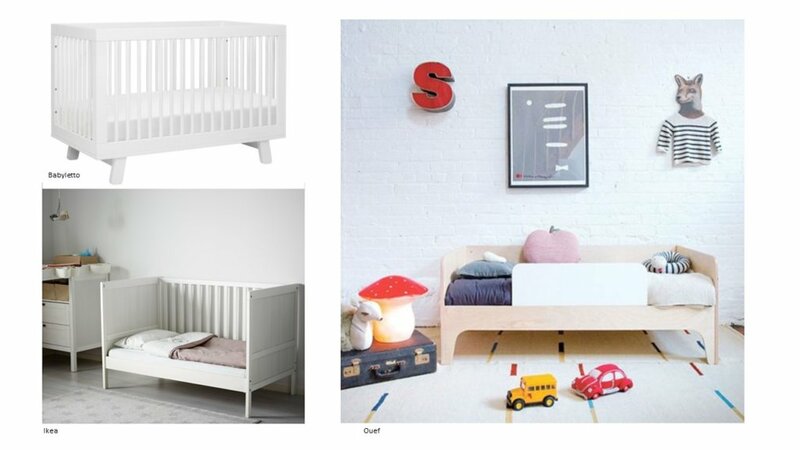 A few worth looking at is the Babyletto Hudson 3- in-1-crib, Ikea’s SUNDVIK, GULLIVER or lastly the Ouef Perch toddler bed can become a bunk bed as your child grows and wants a new adventure and sleepovers?